Created an API using Node.js on my own server hosted on Digital Ocean. The API is capable of tracking high scores across multiple games. User "login" is also supported. Used networking in Unity to send and receive data from the API. At the moment accounts are created manually - I need to work on creating a page on my site to create/manage accounts. Email me directly if you would like me to PERSONALLY set you up with one so you can live on in Tappy Dude history! This game was created as an assessment item for my Cross-Platform Development subject during my Advanced Diploma of Game Programming at AIE. 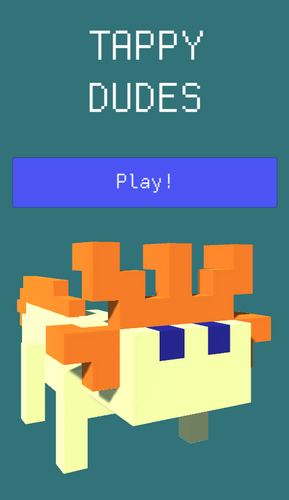 The game is a clone of Crossy Road, the massively popular game by Hipster Whale. Cross-Platform Development - The game was made and tested for PC and Android. 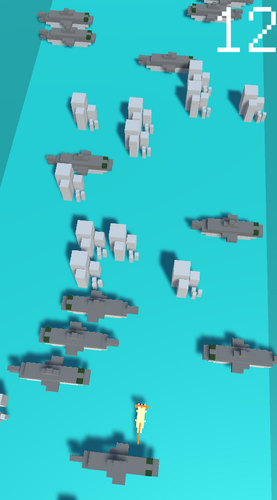 Random/Procedural Generation - the play area consists of rows that are randomly chosen with random elements (such as rock placement, direction and speed of sharks). A controller class creates the play board, adds new rows as the player progresses, and tidies up/removes rows that move off-screen. Touch Inputs - Accepts touch input from a touch device (or mouse control in the PC version) to control the character. Both simple touch control to move forward or directional drag to move multi-directionally. Sound - implements sounds on events such as movement or player death. 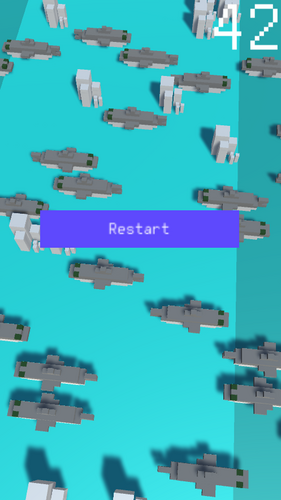 Linear Interpolation - The player character moves between movement points using a curve created by interpolating the start point, end point, and a generated point in the air between the two. Android/PC Mouse: Tap to move forward, tap and drag forwards, backwards, left and right to move the respective direction. I've been warned that the installer executable can trigger a windows defender warning - after looking into it I've found this is common with newly released programs and the only way to stop it from appearing on players computers is to have enough people report on that same message that the program is safe. If you're security conscious you will be running a virus scanner, however if you could please mark it as trustworthy that would help a lot! Nice, simple version of a simple source material. What makes it challenging and sometimes kind of frustrating is that the game can end if you just wait too long without advancing, it seems. If you're interested, you could maybe enter our contest, the Game Development World Championship! Thanks for taking some time to play the game! This does stick a little too closely to it's source - if you stand still too long in Crossy Road you die as well! It is a design feature to keep you always on your toes and moving forward. I can definitely consider your feedback though and I'm already thinking that visually channelling that you need to move forward might make that feature less frustrating. Maybe a glow that gets brighter and brighter until you move - or explode! I'll definitely check out the GDWC - thanks for letting me know about it!